Full disclosure: this is not my kids' favorite meal. But hey, plain cheese pizza isn't my favorite meal, either. Sometimes we all have to eat what other people like. Prep and cooking is pretty quick, especially if you use the shortcuts I include. It takes about 35 minutes, start to finish, and it doesn't generate a whole lot of mess, either. Put the bread in a food processor or blender and process to crumbs. Chop the scallions into 1/4 inch pieces, use the green and white parts. Mix all the ingredients except the salmon in a medium sized bowl. Add salmon and mix well, using a fork to break up any bigger chunks. Use your hands to form the cakes. I like to use about 1/3 cup of the mixture and make a ball, then lay it on the parchment and gently flatten it. The cakes will seem too loose, but just pat the edges back together. Bake 400 for 18 minutes. While the cakes bake, mix together all the sauce ingredients and decide how much hot sauce you want to add. Steam some broccoli (3 minutes in the microwave) or make a salad. 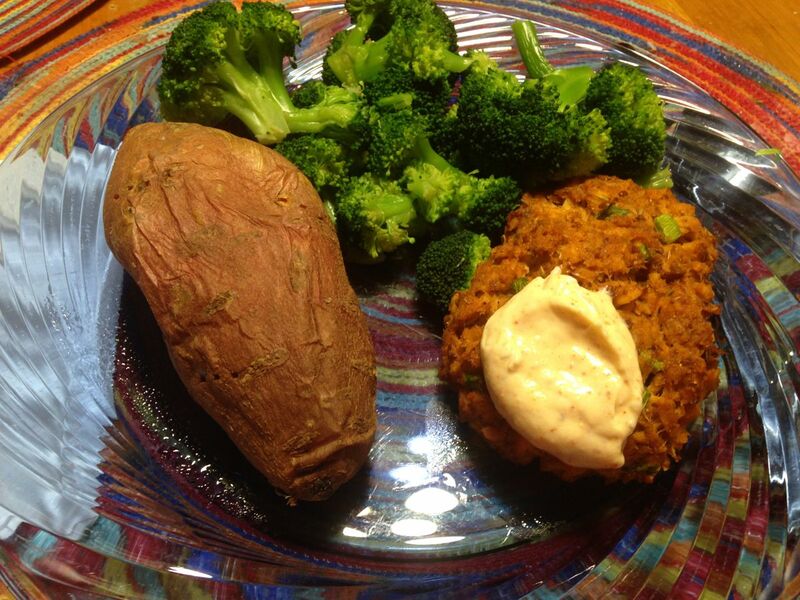 A piece of whole grain bread or a baked sweet potato are also awesome accompaniments. Serve the cakes with a small spoonful of the sauce, and the side of your choie. Enjoy! Eliminate the oregano, thyme, paprika, and cayenne. Add 1/4 tsp dry ginger. Eliminate mustard, thyme, lemon, and paprika from the sauce and replace with lime juice and an extra 1/4 tsp of garlic for a garlic lime sauce. Eliminate the oregano, thyme, paprika, and cayenne. Don't bother with the sauce, and serve with ketchup just like my grandma did. Go nuts and put some macaroni and cheese on the side! I use 'canned' salmon that comes in pouches with the skin and bones removed. It's a little more expensive, but it's a good time saver and I personally hate dealing with the bones. You either have to pick them out or crush them and either way my hands smell fishy. I also use the lovely little jars of minced garlic for the same reason! Make sure you use fresh bread in this recipe. Stale bread will make the cakes too dry. This recipe also has a little heat to it. If your family is really sensitive to spice you could cut out the cayenne. For my kids, I serve this meal with a hearty side dish. I usually make a protein plus type of pasta, or add a piece of cheese to their plate. I figure someday they'll enjoy it, but until then I want them to get enough protein to sleep all night! If creamy sauces aren't your thing, try using a squeeze of lemon (or lime) juice. Most canned salmon is wild caught, so you're getting some great Omega 3s in this meal! It is a little high in sodium, due to the sandwich bread and mayo used. If you eliminate the added salt you can save about 400 mg of sodium. For my Body Back sisters, this recipe is pretty close to your nutritional guidelines. You could use egg whites instead of a whole egg, but the cakes don't hold together very well and it would only save a 1.6 grams of fat. You can definitely eliminate the sauce and use a squeeze of fresh lemon juice. That substitution will shave off 47 calories and 2 grams of fat.